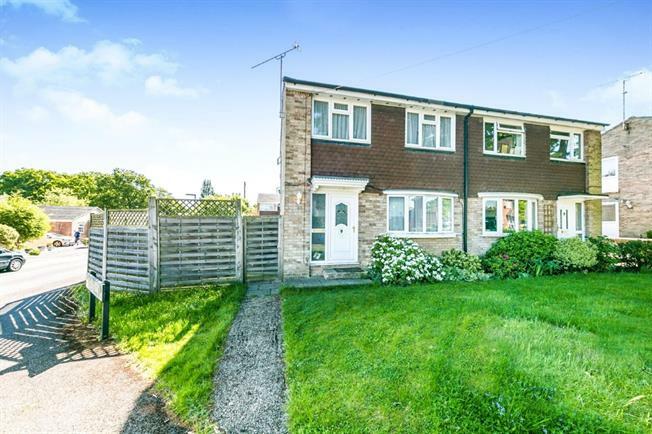 3 Bedroom Semi Detached House For Sale in Bagshot for Asking Price £385,000. A well presented and incredibly spacious three bedroom semi detached family home in a desirable location close to the village centre in Bagshot with easy access to local schools and amenities. Accommodation comprises a spacious entrance hall, living room, re fitted kitchen breakfast room, large conservatory with access to the rear garden, master bedroom with fitted cupboards, a further double bedroom, a good size single bedroom with fitted wardrobes and a re fitted family bathroom. A further benefit to the property is a custom built spacious outside office which is fully insulated, double glazed with full electrics with 10 sockets situated in quiet secluded area of the back garden. Outside the front garden is mainly laid to lawn, a pathway leads to a good sized rear garden which is fully enclosed mainly laid to lawn with a patio area and the home office. Further benefits include a driveway providing off street parking and a single garage.